Lady Starlight When I wrote “Lady Starlight” for inclusion in the album “Desolation Boulevard”, little did I realise that I would become the first member of Sweet to release a solo single. In fact I didn’t really imagine that I would even sing it, after all Brian was the lead vocalist. Mike Chapman, our producer, immediately suggested that I sing the song after hearing a run through in the studio with an acoustic guitar. 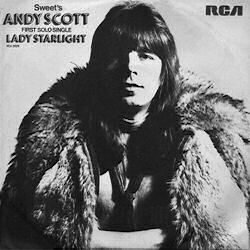 Once the album was completed, someone at RCA Records could see the potential of “Starlight” as a single but without Brian’s voice it was deemed a bit radical to put it out as a Sweet single thus “Lady Starlight” by Andy Scott was the answer. After a few subtle production tweaks by myself and Mick at Air Studios [London] and some superb keyboard enhancements from Pete [18 with a Bullet] Wingfield, the solo single version was ready for release. And the rest is history. Where D’ya Go “Where d’ya go”, the B-side, was recorded at Kingsway Studios. Acoustic guitar, voice, no click, in other words free-time. Louis Austin, Sonic Architect [engineer], suggested handclaps enhanced by the “lift shaft echo” which became the tempo. When I played the song to Mick he urged me to let him put some drums on it and this brilliantly helped to disguise the free-time element. Getting the drums to tape took immense concentration from Mick and after a few takes, job done, he was sat behind the kit listening to playback with a towel covering his head, rather like a boxer in his corner. During all of this, Louis and I were in the control room, chatting and doodling on the guitar when suddenly as the track finished Mick yelled “Bloody shut-up!”. Apparently instead of hearing his performance he had mainly heard our conversation and doodling but was too tired to say anything until the playback was over. We kept it in the final mix! I added bass and an electric guitar and there ya go.